Nine Network Australia (NNA) is delighted to welcome SMPTE Australia Section members and guests to a technical overview and tour of the National Playout Centre (NPC) for Nine Network. NPC opened in 2012 and originally served 18 channels across the country. 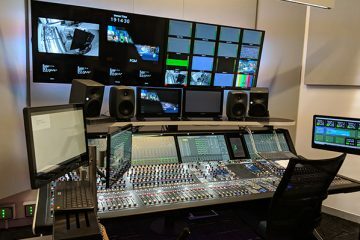 The multichannel content playout solution allowed the broadcaster to streamline technical operations by centralizing playout within a single, highly efficient and modern broadcast facility. The initial file-based playout solution has had to rapidly scale to meet new opportunities over the years as the NPC provides for new markets, additional channels and the expansion into streaming and catch-up services on the 9Now digital platform. NPC currently plays out 35 channels servicing Australia with free-to-air terrestrial broadcasting. Michael Greenwood, General Manager and Murray Robinson, Engineering Manager – Nine National Playout Centre – will give an overview presentation of the scalable content playout solution implemented, technical challenges and learnings encountered, followed by tour of the facility. Places are limited and preference will be given to SMPTE members, so register now to secure your place for this Section Meeting.